For many adults, a Disney cruise means family time or, at the very least, being surrounded by other families. 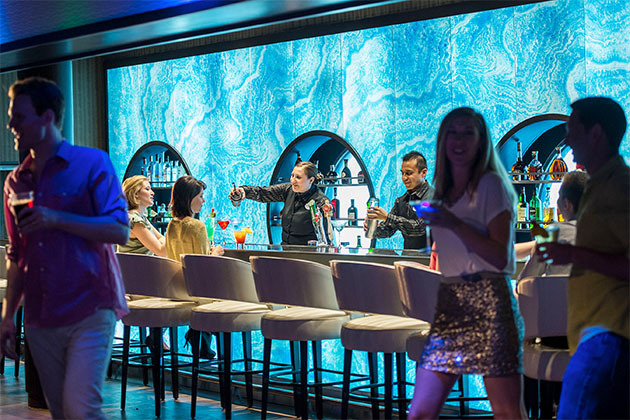 But when you cruise with Disney, bars and other adults-only spaces abound; with more than two dozen watering hole options across the fleet, you'll have no trouble finding some much-needed time for yourself while the brood is in bed or in one of the line's fabulous kids clubs. So, if your little ones are yearning for a trip with Mickey but you just don't know if you can handle that much mouse in one week, don't despair. 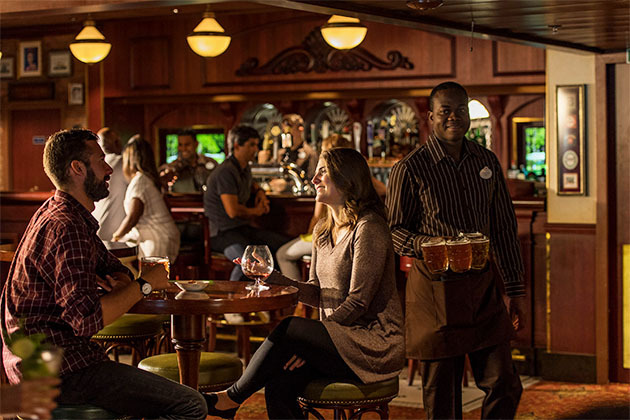 Take a deep breath, and mentally plan your very own pub crawl with our list of Disney cruise bars. This nightclub's under-the-sea take on decor adds a bit of whimsy to the dance-all-night venue, where cruisers can also order cocktails and other beverages. Bon Voyage is a centrally located bar, found just off the atrium. It's likely the first place you can access alcohol on your cruise after boarding. It's also ideal for snagging a drink on your way to other areas of the ship. This splash-up bar, located near the adults-only Quiet Cove pool area, provides easy access to alcohol while you're soaking in the pool or hot tub. Found within the adults-only area, this enclosed space features extra-fee coffee, lattes and other specialty coffee drinks (including ones with alcohol). Currents is the adults-only bar located on the adults-only sun deck, above the adults-only Quiet Cove pool. Located on the main drag that runs through The District -- a family-friendly alcove of venues that turn into adults-only spaces after 9 p.m. -- this is the spot to hear live music while sipping cocktails. This adults-only nightclub and bar takes its name quite literally with a theme that represents a caterpillar turning into a butterfly. It's a bit trippy, but it's where you'll want to end up if dancing is on your to-do list. The venue also hosts late-night games and events for adults. This underwater-themed lounge plays host to nightly dancing, karaoke and game shows. Cocktails round out the offerings. As its name suggests, Keys is a piano bar with an old Hollywood vibe. It features a wide range of alcoholic drinks, as well as specialty coffees. This Italian-themed area boasts a centrally located bar that looks like a carousel. This wonderful adults-only wine bar, tucked away on the top deck between the extra-fee Palo and Remy restaurants, offers travel-themed decor and charming views from its gorgeous outdoor terrace. This Irish sports bar is perfect for catching live sporting events while you down a pint or two. Board games are available for those wanting to create their own competitions. 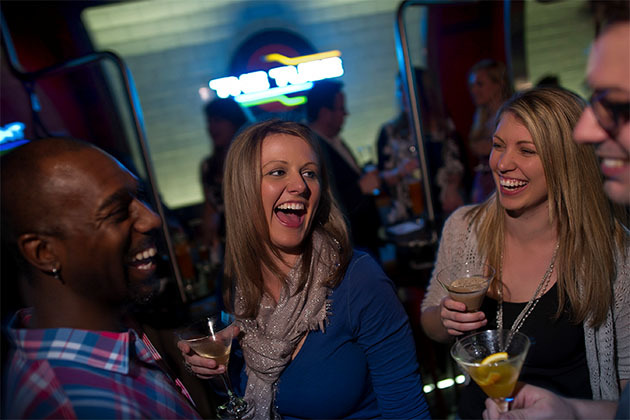 It's also the spot that hosts martini tastings, singles mingles and other activities. Reminiscent of a French boudoir, this Champagne bar features lots of gold, velvet and Victorian furniture. It's a garish but fun spot to enjoy some bubbly or cognac. Planning to head to a show in the theater? Preludes offers pre-entertainment beer, cocktails and snacks like cookies, candy and popcorn. This adorable pink-hued Champagne bar has a bubble theme and dim lighting that make it a quiet, refined space to enjoy a drink. 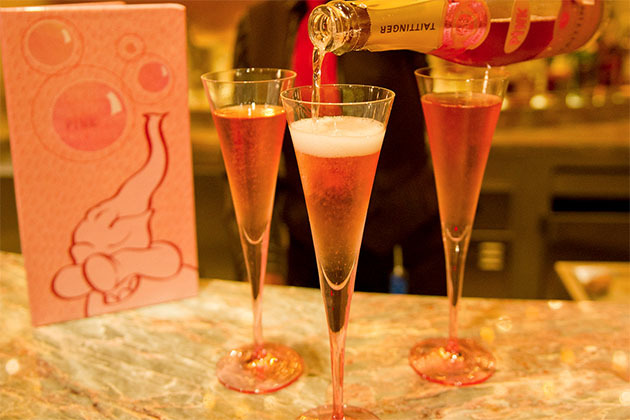 (Try the Icy Pop cocktail, which includes Champagne poured over a raspberry, lime or strawberry ice pop.) While you're at it, try spotting the dancing elephants that appear on the walls at random intervals. No, our noses aren't growing: This complimentary pool deck pizza counter also serves beer. This Art Deco venue provides live music and a bar that serves free appetizers in the evenings. Passengers will find big-screen TVs broadcasting news and sporting events throughout the day. This pub is where sports addicts will find TVs to watch live games. Beer and other alcoholic beverages are available, as are for-fee nibbles and board games for anyone not interested in televised competitions. The equivalent to the Cove Bar on Disney's older ships, Signals serves as the pool bar in the adults-only Quiet Cove area. This martini bar offers virtual views of famous cityscapes as you sip. Every 15 minutes, the scene changes, whisking you away to a different locale. Located on the pool deck, next to the Eye Scream ice cream counter, Sulley's sells smoothies and "drink of the day" cocktails. Drawing inspiration from London, this adults-only nightclub features subway-like seating, a light-up dance floor and even replicas of the city's signature red phone booths. Located behind the big screen and under the sports court, Waves serves as the ship's main pool bar. To learn more about alcohol at sea, check out these other thirst-quenching reads.